This looks like a great spot for a summer home. While I’m at it, why don’t I adopt some of the native wildlife? The kind of creepy Worgen that likes to taunt you about his spiders’ feeding habits every time he kills one of your poor little buddies. That’s what kind of guy! So you’ve bested the level 5 bunny girl. Now for something a bit more challenging. And by “challenging”, I mean: “really annoying and possibly fatal to your pets.” To begin with, your pets should all be level 7 if they want to match up against his eight legged gang. It would also be nice to have one that does well against beasts. A Mechanical would be great, but a Flying pet works too. If you have a Critter pet you want to use, be very careful with it. Shall we begin? Your creepy pets don’t scare me Bub! Webwinder is a Beast. He likes to eat your pets. But first he likes to wrap them in his Sticky Webs and use his Poison Spit to take down their health. 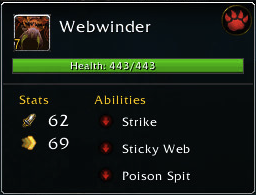 He’s probably the most annoying of the three because, even if you manage to kill him first, he will still regularly kill the pet you attack him with as his Sticky Web prevents you from swapping out for two turns. So if his poison doesn’t finish you off, his next pet will still get a good chance at a free kill. If you have a chance to swap that first pet before it dies, you should take it. Blackfang is also annoying. 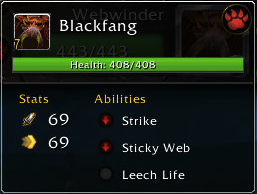 He doesn’t hit as hard as Webwinder but he can heal himself with Leech Life. This makes him die a little bit more slowly. Leech Life also heals for twice as much if you are webbed, it hits harder against Humanoids and weaker against Aquatic pets. 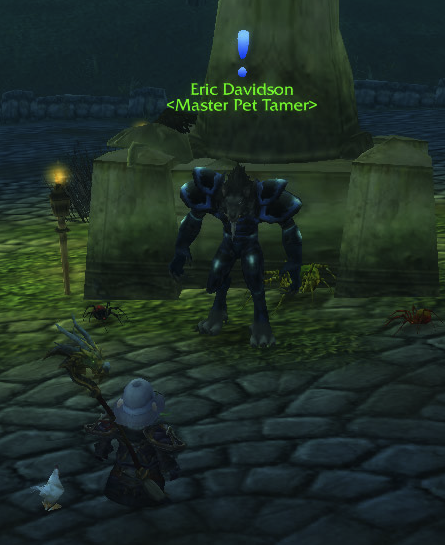 Really, the only thing you can do for most pets is to damage him harder than he can heal himself. However, if you have a burrow or dodge ability, try and time it to avoid either his Sticky Web or Leech Life. Darkwidow is the least annoying, which isn’t saying much. Instead of Sticky Webs, she uses Brittle Webbing. This ability doesn’t prevent you from swapping, but instead damages you every time you damage her. 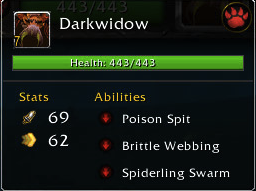 She also has a poison and this weird ability called Spiderling Swarm which hits extra hard if you are webbed. The key to her is to use big attacks, instead of lots of little attacks, as this will reduce the damage you take from Brittle Webbing. And remember you can swap if you need to. RNG can be a factor, so don’t worry if it takes you more than one try. If it gets too frustrating, you can try and level one or more of your pets to 8 and then your extra speed and hit points can make the difference. Finally, don’t expect all of your pets to survive! Your surviving pet will get a ton of XP, even if your dead ones don’t. 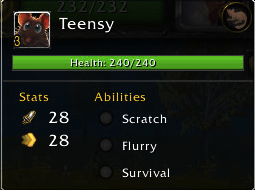 So your pets should all be level 5 or 6 now. That’s pretty cool. But unfortunately the next Tamer is level 7. Also, his pets are all nasty spider things that hurt you. Unless you’re packing some serious hardware (Darkmoon Tonk anyone), I wouldn’t try and take him on until you’re level 7. But that’s okay because there’s plenty of cool pets you may not have seen yet! Let’s look at them zone by zone. Fluxfire Feline is so cool that they’re going to nerf it in the next patch. 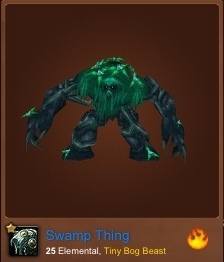 Still, it’s a mechanical that does beast damage so it’s worth leveling a few pets on it until you get an uncommon. Snow Cub is also very cute though it may take a long time to get a rare one. Little Black Ram is a Beast. It’s also not that hard to find a rare, but they are hard to capture and they sometimes bring an identical friend. Expect to wipe out a few times if your pets are at or below level. That being said, I have two rares and still haven’t maxed even one out. This has a lot to do with the rough treatment Beasts get in the end game. Tiny Bog Beast is hard to acquire, especially in a rare or uncommon, but it is very good when fighting tamers in the end game. So cap one and hold it until you get an upgrade stone. But don’t waste hours trying to get a rare. The rest of the pets are okay. Darkshore Cub is worth the trip and seems to have a rare fairly often. Its hibernate ability makes it very hard to kill. The rest of the pets, not so much. A Cheetah Cub, some cool looking snakes, and a (sporadically spawning) Harpy Youngling. What’s not to love? Kind of hard to get to if you’re alliance. But it’s got lowbie versions of some cool mechanical pets. You can’t fly in this zone, but the Spirit Crab is fairly easy to farm for a rare if you’re short on cool looking undead pets. 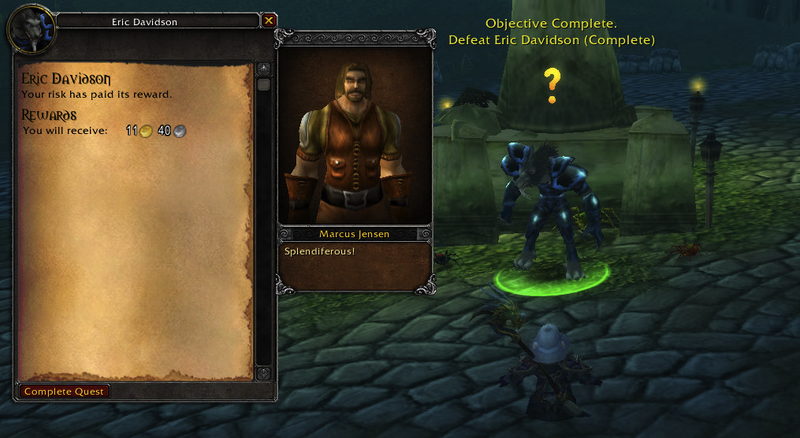 Lost of Lordaron is worth grabbing, though you probably need a lowbie alt if you’re alliance. All the pets here pretty much fall into the meh category. If you run across a rare, capture it, but you’ll see all of these pets, or at least something like them, over and over again. There’s no point in grinding for a rare or uncommon here. 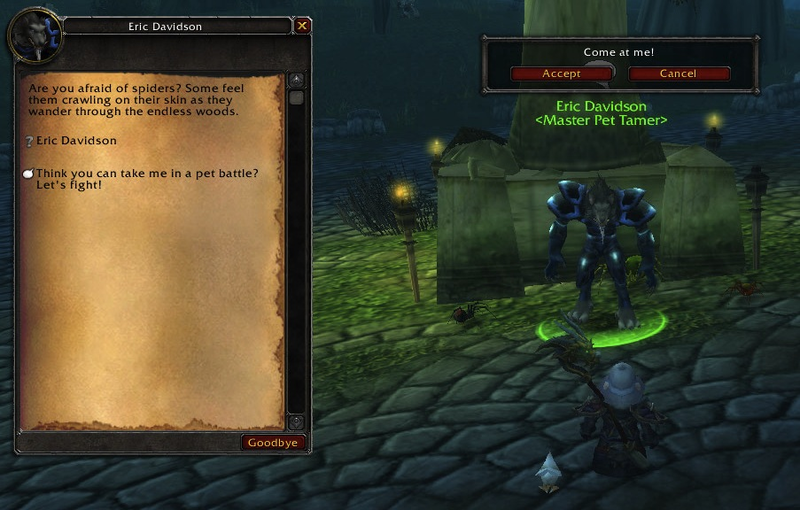 Like Elwynn, there are some pets here you will see again and again. The snake and shore crab, for example. The prairie dog is cool, but you’ll have another shot at one in the Barrens and other zones. If you don’t have a mechanical squirrel or something like it, you should try and get a Tiny Harvester in uncommon or better. Or maybe not. The Fledgling Buzzard there is kind of cool looking, but it will take awhile to get a rare. The rest are not really worth farming for either. It’s a good place to level, so go ahead and battle here. Maybe you’ll luck out and get a rare, but don’t worry too much if you don’t. Some people seem to like the owl here. Nothing else is that interesting. 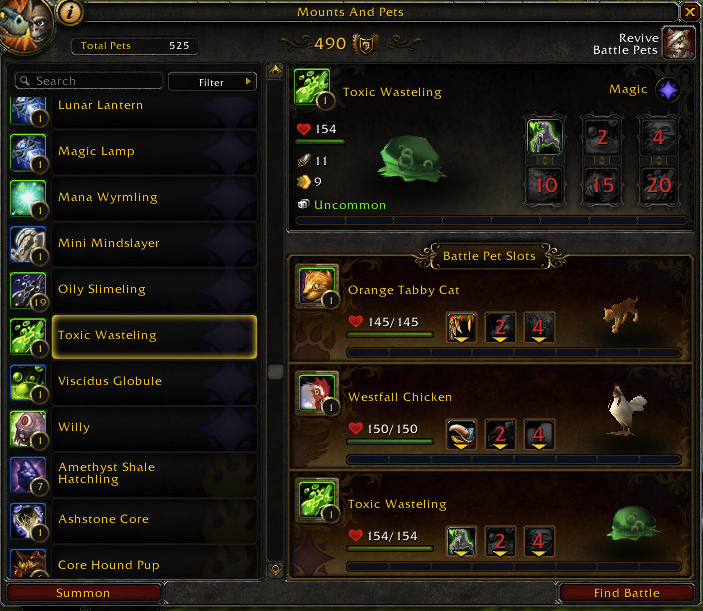 A nice variety of pets to help you level, but nothing special and it’s hard to get to from alliance side. Lots of Beetles, Snakes, and Toads. A Lizard that’s cool, but not worth the farming it takes for a rare. You can totally skip this place! The Gazelle Fawn is very cute but it has the same abilities as a common variety Fawn. So kind of worth the visit if you’re into cute. Otherwise skip it. 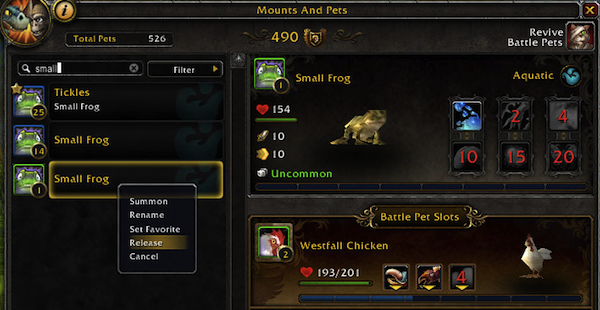 So you can’t fly here and the pets are cool looking variations on pets you can get elsewhere. You be the judge. No flying as well. The Ruby Sapling, is cool, though you can get a pet from Alliance questing with the same abilities if you don’t want to make the trip. A good place to go for weird pets. But you don’t need to go out of your way for it. 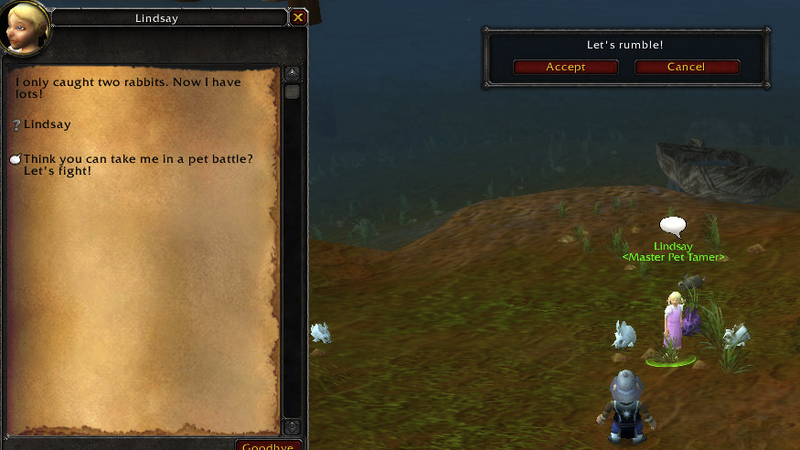 So you’ve bested the Westfall tamer and your pets are now level 4. 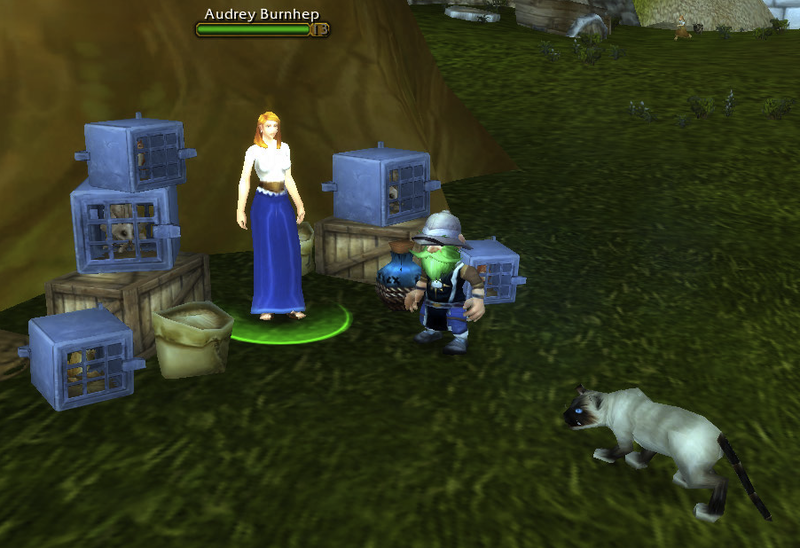 However, you’ve flown out to Redridge and you now see this Darling Child with her level 5 bunnies. 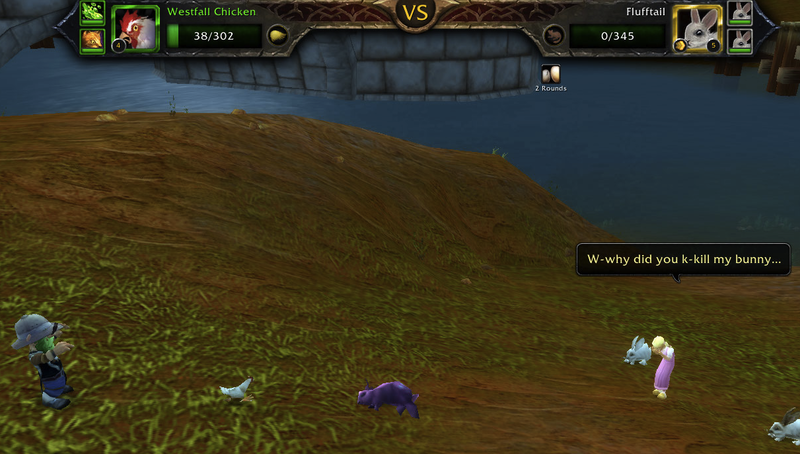 The conundrum: do I kill her pets now (they’re only rabbits, right) or do I wait until I’m level 5? 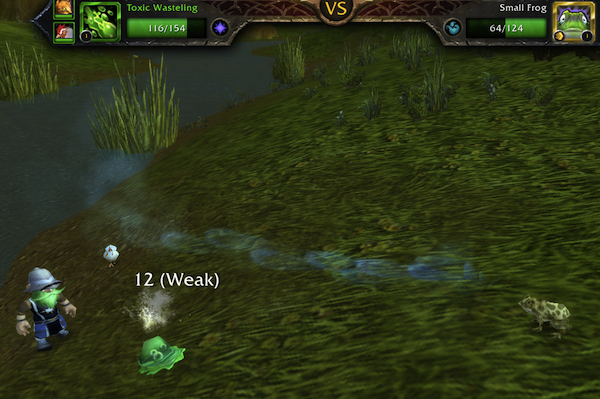 They’re all Critters, so it depends on how many Beast pets you have and how many Elementals or Undead you don’t have. If you’ve got two or more Beasts, go for it! If you’ve got one Beast think about it (I managed to do it, but it took three times and I lost one pet). Otherwise, you should probably level them first. 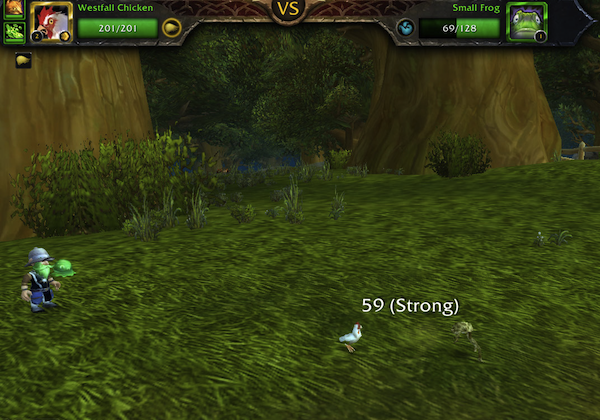 Fortunately, there are lots of buzzards behind Lakeshire and a ton of rabbits living along the Lakeridge Highway. Get a few kills each and your pet crew should be level 5. What a darling child. How on Earth did she get so many rabbits? So there’s this kid with too much time on her hands. She’s stuck in this weird little town that takes 5 years to get a bridge built. What does she do with her spare time? Why she raises lots and lots of vicious little bunnies! We need to help control the rabbit population and I’m going to show you how! Dipsy is a Critter. That means Beast abilities will do extra damage to him and Elemental abilities will do less damage. It also means Humanoids take less damage and Undead pets take more so be extra careful if you have an Undead pet. The bad news for you is, they’re all Critters so you can’t pick your battles as easily as you can with other trainers. The good news, if you have a Beast, is that you should be able to take one and almost two of these guys out with just the Beast. 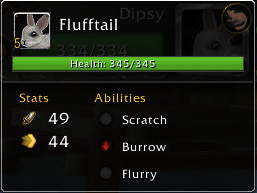 Dipsy has an ability called Flurry. This ability hits a few times for moderate damage, but hits an extra time if Dipsy is faster than you and attacks first. If you can slow Dipsy down a bit, go for it, otherwise, you just have to hit Dipsy as hard as you can and he’ll go off to Bunny heaven. 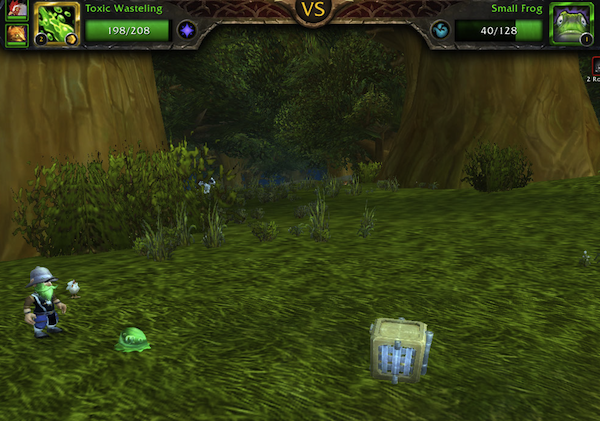 In conclusion, this fight can be very annoying if you don’t match up well against Critter pets. Even if you do match up okay, you still have to pay attention to the abilities. It may take you a few tries, but it’s good practice. Don’t worry Lindsay. I’m sure you’ll have a new batch of bunnies quite soon. 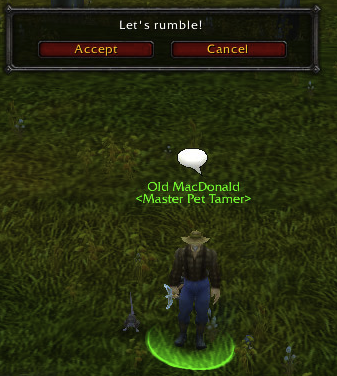 Poor Old MacDonald. I really feel for the guy. All he has left is a few pets and a dream. 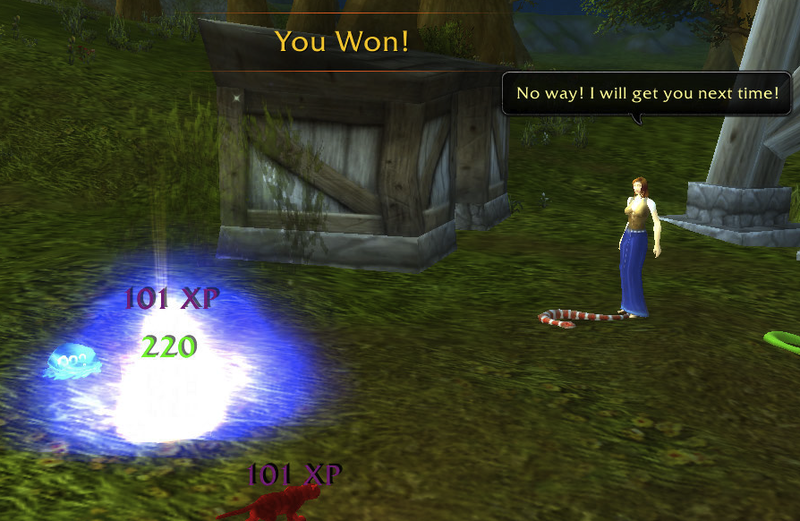 That still doesn’t stop me from beating him once a day for the large amounts of lovely, lovely XP he gives! Clucks is level 3. 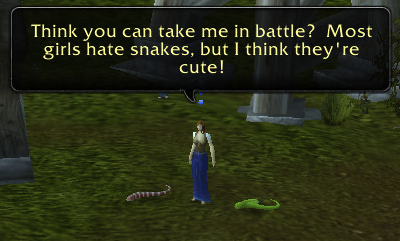 Your pets should all be level three after soundly beating up the snake lady. So it’s all good. She’s also a Flying pet (even though she’s a chicken). So that means she takes less damage from Beast abilities and does extra damage to Aquatic pets. It also means she takes extra damage from Magic abilities. So if you’ve got a Beast (and you should), put it on a different pet. And if you’ve got a Magic pet. Sick it on her! Clucks also does this three round ability called Flock. This is where you get run over by a flock of angry chickens. They don’t do much damage individually, but they put a debuff on you for two turns that causes you to take 100% extra damage. This is not good. You will see this kind of ability many many times when fighting tamers. So remember, if your pet has medium to low health (or even if it doesn’t), you should consider swapping it for another pet after Flock is done because otherwise it may take two very large hits. 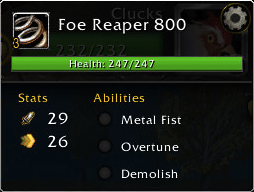 Foe Reaper 800 is a tiny mechanical harvester of death! He harvests corn and okra too, but mostly he just harvests death!! Actually, he’s not that tough. However, since he’s a mechanical he does extra damage to beasts and takes less damage from magic. 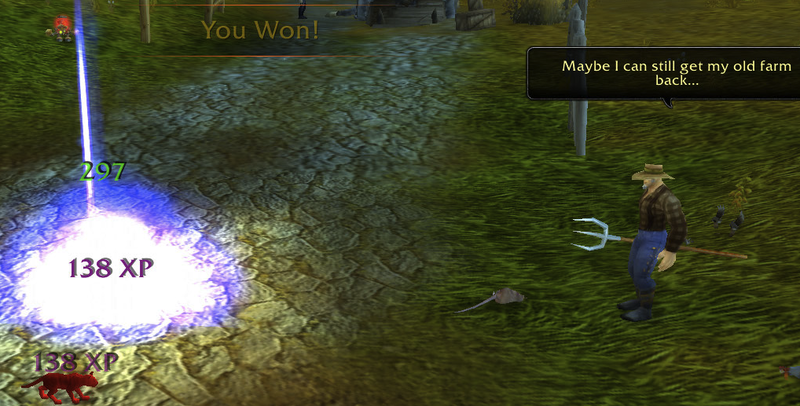 This means if you have a Beast or Magic pet you really want to send it against someone else. Also he takes extra damage from elementals, so if you have an elemental here—attack! Teensy is a mouse. He’s sort of cute and your Beast pet will find him very delicious. Also, keep any Undead pets out of reach of Teensy. That is all. 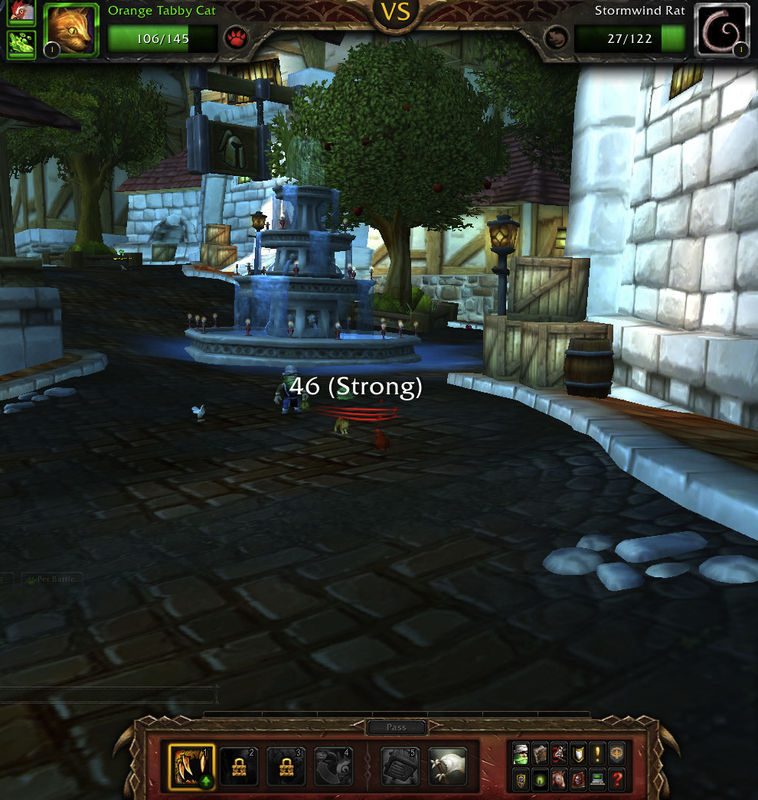 Quick note: just in case any of you are like: Y U NO KALIMDOR BRO? 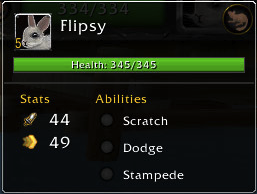 I’ll just point out that my gnome mage can do these much faster than any of my Horde side toons (GG Teleport), and leave it at that. I know what you’re thinking: Snakes… why did it have to be snakes! Or maybe you’re thinking, do the neighbors know about her little snake obsession? In any case, the Crazy Snake Lady has two snakes and they’re both level 2, but she loves them anyway (maybe a little too much). As long as your pets are all level 2, she’s kind of a pushover. Especially since you get to use one more pet than she does. I’m going to go through the fight anyway since it’s a good introduction to those wacky pet tamers you’ll be spending so much time with. Fangs is level 2, but he has three abilities! ZOMG haxx! Since he’s a beast, he will eat up your little critters, but has a real problem with flying things. I guess he chokes on the feathers or something. 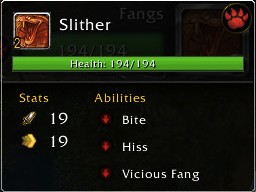 Slither also has three abilities, which makes the crazy snake lady a huge hacker or something! But never fear, he won’t poison your little pets. He’ll just slow them down and kill them with his Vicious Fangs! Kill him quickly as he hits harder with that ability the more he uses it on your pet. 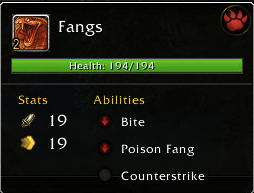 If you start getting beat up too much, swap pets as that resets the fang damage counter. An easy win and we’re now level 3! There’s really not much more to this tamer. So let’s head on over to Westfall next!